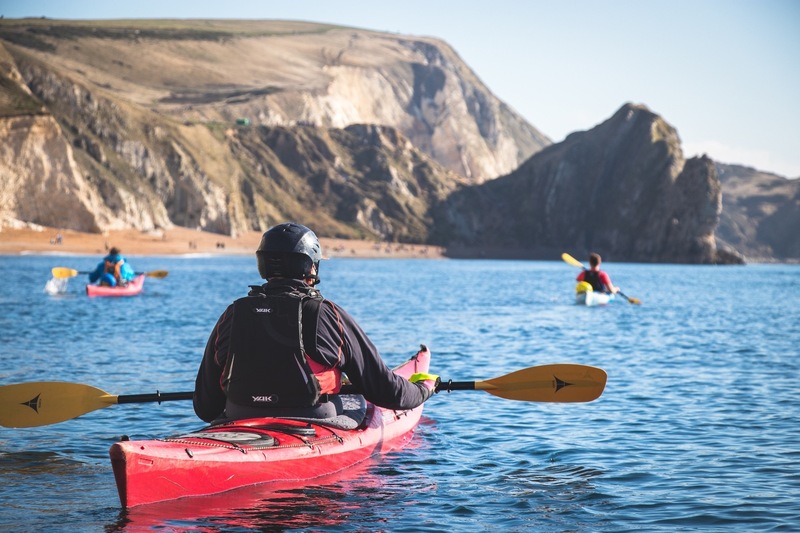 Sea Kayaking Dorset offers us the opportunity to paddle along towering cliffs, calm bays and beautiful harbours. On this trip you’ll undertake a journey where there will be many opportunities for testing your skills and receiving some coaching to improve your paddling. Most days are based out of the Purbecks area, Old Harry Rocks or Ringstead Bay, your coach will be in touch the week beforehand with a more accurate starting location when they have a better idea on the weather for the day. We do recommend that you have some experience (3 hour introduction or Learn to sea kayak day trip) as a full day can be a lot of activity for the complete beginner. If you are very confident and comfortable around the sea contact us to discuss the suitability of Sea Kayaking in Dorset for you. You’ll receive a day of expert coaching and guidance. We supply all paddling equipment you’ll need for a great sea kayaking Dorset day. On the Sea Kayaking Dorset day there will be chances for; Sea kayak technique practice, rockhopping through cliffs, caves and rockgardens, exploring remote areas and plenty more! This is one of our most popular sessions and a great fun day out to sea, don’t miss out! Participants must be 16 years or over. Experience is essential.